What does a Public Mental Health Service Look Like? While developing a lecture to prepare nursing students for clinical experience in community mental health, I realised that some others may be interested to know what a public mental health service looks like. 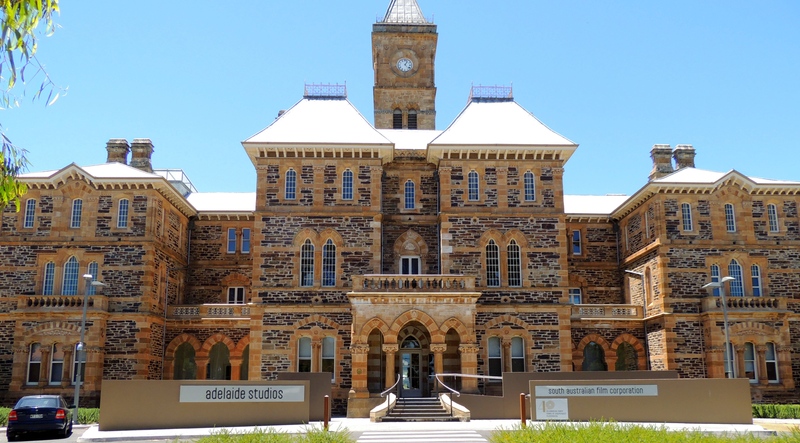 In the early 1990s I first gained mental health experience working across two aging purpose-built mental health facilities – Hillcrest Hospital and the beautiful Glenside Hospital (now being used by the South Australian Film Corporation). These facilities had started out as asylums where people were hidden away from the rest of the world behind Ha-Ha Walls and layers of misunderstanding and stigma: “the madhouse”, “the funny farm”, “the loony bin”, “the nuthouse” etc. That’s not a very accurate (or kind) representation of a what a public mental health service looks like in Australia in 2015. Let’s try to get our head around what a public mental health service actually looks like by deconstructing its elements. It’s not about grand old buildings any more; it’s about an array of services, most of which are community-based. 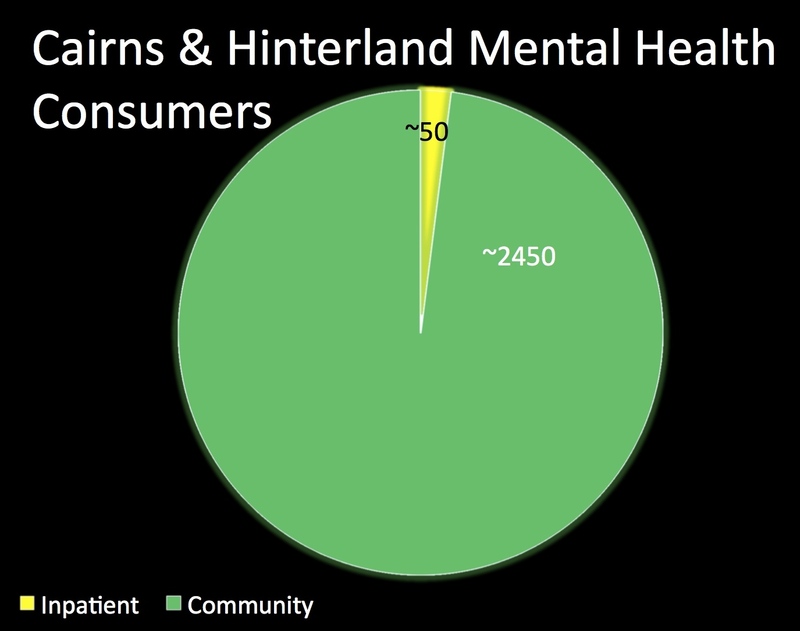 I’ll deconstruct a mental health service I know a bit about, but to make it easy for myself I’m leaving out the “and Hinterland” part and some other details of the Cairns and Hinterland Mental Health Service. 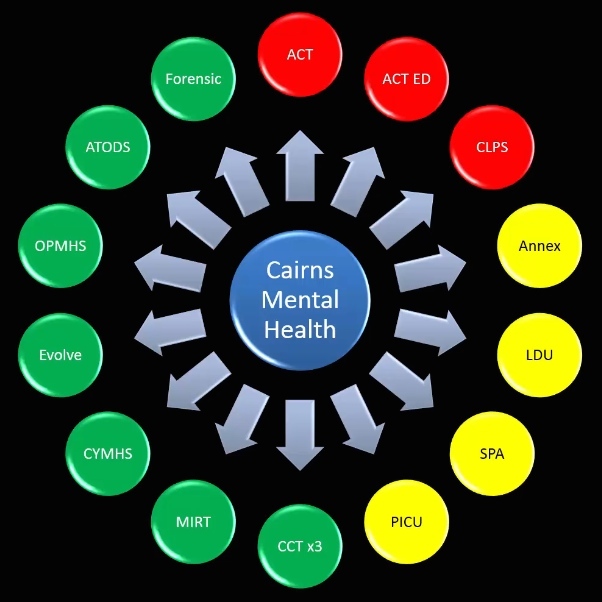 Hopefully this will give an overview of what components make-up a mental health service in a large regional city. Mental health care is not just about a public mental health services: local GPs, psychologists, social workers, occupational therapists, mental health nurses and others are working in a wide variety of private and non-government organisations to support people in their recovery. It should be obvious by the intro and daggy look of my web page that I’m not representing the Cairns and Hinterland Mental Health Service here, but just to clarify: I’m not! If you’re feeling miffed or misled, please see points 10 and 13 on the meta4RN “About” page (here) or bypass me and go straight to the webpage for the Cairns and Hinterland Hospital and Health Service (here). Sorry for the confusion. I know that there a bits I’ve left out. I acknowledged that in the intro. Paul McNamara, 18th January 2015. This entry was posted in Blog and tagged community mental health, jargon, mental health, NS3360 on 18 January 2015 by Paul McNamara. Hi Paul, I think that an improved focus on strengths and recovery is the way our mental health care system is desperately needed. As health care providers we could be providing care in a different manner. At the moment we ( in Queensland) have a structured way of providing care care review summary plans ( you know the ones) , in addition to all of the other required suite of bits of paper that we need to complete (MHA related stuff). We all have been trained to function within these parameters. What has not happened is we have not been trained/mentored/educated/supported in a model of recovery based care despite the fact that the health care system within which we both function has bits of paper (recovery plans etc). Curious n’est pas? There has been an increase in the hearing voices movement as well as the open dialogue initiative which both focus less on the medical model ( meaning psychopharmacology). It is my belief that we ( the big we) could take advantage and learn from other states ( countries ) and implement the Strengths Model of Case Management ( Rapp and Goscha) and the Wellness Recovery Action Plan ( Copeland) into our core practice. I know we have the bits of paper floating around but to me its like have a cheat sheet for MSE without the education bit. I admit that I am a bit biased having been part of the implementation/mentoring/teaching team for both of the above components when I worked in Victoria and I have attached a little document below with some of the outcomes.